Chicago’s North Shore Convention and Visitors Bureau offers a complimentary planning service to help you with the logistics of creating a spectacular North Shore experience including any needs you might have for group overnight accommodations. For more information, please submit an online Request for Proposal (RFP) or contact Caryn Shulman at 847-763-0011 ext. 125 or email her at cshulman@cnscvb.com. 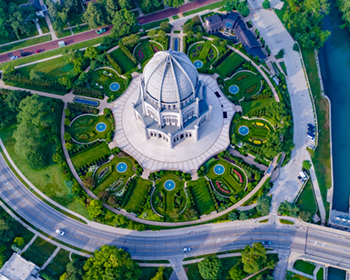 Get ready to be amazed by the grandeur and beauty of the Bahá'í House of Worship, one of only nine Bahá'í temples in the world and the only one in North America. The oldest surviving Bahá'í Temple in the world features an auditorium with walls of lace-like ornamentation and 135-foot dome. The temple is also known for its exquisite gardens and fountains. Next, walk in the footsteps of a former U.S. Vice President as you explore the Charles Gates Dawes House, a three-and-a-half story mansion overlooking Lake Michigan. This stunning chateau is a National Historic Landmark and is home to the Evanston History Center. Tour the home’s original artifacts and rooms, which detail life at the turn of the 20th century. Walking Tours available. Group lunch in Evanston. Another historic home, the Frances Willard House, pays homage to the American educator, temperance reformer, and women’s suffragist. Her influence was instrumental in the passage of the 18th and 19th Amendments to the United States Constitution. Her home is located in Downtown Evanston and a docent-led tour highlights her accomplishments as well as the place where her movement flourished. Spice House is known around the world for having the highest quality of spices and herbs. Hear from second-generation spice merchants about the special work that goes into hand selecting and preparing spices and herbs. Next, pay a visit to Old Town Oil and sample imported 100% Extra Virgin Olive Oil and aged balsamic vinegar from all over the world. Continue your culinary adventure with lunch at The Great Harvest Bread Company where you can enjoy custom-made sandwiches on freshly baked bread made that very day. 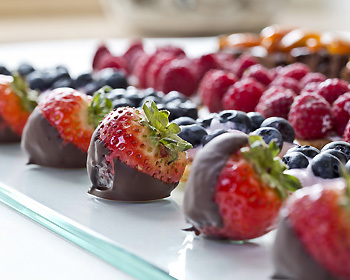 For the final stop, we’ll visit Illinois Nut and Candy for handmade chocolates and other specialty products. One of the premier tourist attractions in all of Chicagoland, the Chicago Botanic Garden is not only a beautiful place to visit but is also known as one of the world’s great living museums and conservation science centers. 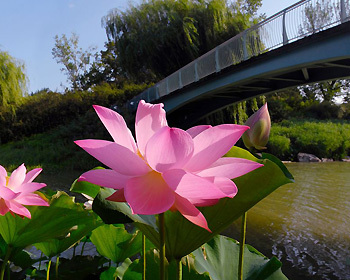 Over one million people have visited the Chicago Botanic Garden’s 27 gardens and four natural areas that are uniquely situated on 385 acres on and around nine islands, with six miles of lake shoreline. View the Garden’s renowned Bonsai Collection, the exquisite Japanese Garden, and the hidden rooms inside an English Walled Garden on foot or with a docent on the Garden's tram. Season events, Carillon Bell Concerts, Wonderland Express during the holidays and more. Discount shopping in The Gift Shop. The largest of its kind in the Midwest, the Illinois Holocaust Museum and Education Center was designed by renowned architect Stanley Tigerman utilizing architecture itself to stir the emotions associated with the Holocaust and to provoke thought and introspection. 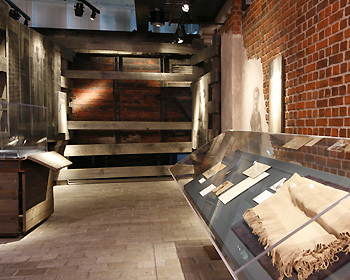 The exhibition tells the story of the Holocaust, from pre-war German life through life in the ghetto and concentration camps to the eventual liberation and resettlement throughout the world. The museum has more than 500 artifacts, documents and photographs. The tour takes 2+ hours total, and groups can request a docent. Early VIP entrance and shopping discounts for your group. Visit the Take a Stand Center, an Interactive Survivor experience. Request an Architecture Tour and visit the travelling exhibits all year. Following your visit to the museum, have lunch at one of the nearby restaurants. Halim Time and Glass Museum, located on a quiet neighborhood street in Evanston, houses over 1100 time pieces and over 70 stained glass pieces of art. The building is five stories tall and is filled with history, art and the study of time. 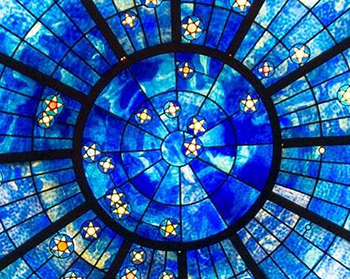 The museum offers a comprehensive look at the Master of American stained glass as Louis Tiffany and John La Farge. The clock exhibits time pieces from all over the world in: Imperial Chinese Time pieces, French clocks by the greatest Horologist and American history of time and clock making. After lunch, visit the American Toby Jug Museum. Showcasing the largest collection of Toby and Character Jugs in the world including many rare and unique jugs within the complete Royal Doulton collection. On display are over 8,000 pieces illustrating their evolution from 1765 to the present day. No art experience required! Create your own festive, whimsical masterpiece at Bottle and Bottega in Evanston. 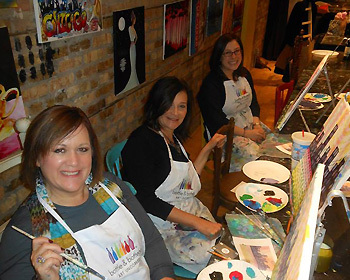 An artist will lead your group in painting while you snack, drink and share lots of laughs. Best of all, you’ll have a treasure to take home with you. Afterwards, enjoy lunch at a nearby restaurant. Next, visit the Evanston Art Center. 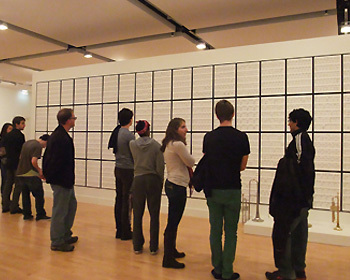 Docent tours, exhibiting artists talks or take a class with your group. Dave’s Rock Shop in Evanston- A shop and a pre-historic life museum showcasing one of the largest private rock collections on display in United States. Selling authentic fossils, colored minerals, unique jewelry and large assortment of beads and precious and semi-precious stones starting at 90 cents and up. This is a store for beginners as well as serious collectors. Then, 2 doors away… Ten Thousand Villages This fair trade retail phenomenon was founded by visionary entrepreneur Edna Ruth Byler in 1946. It has grown into a global network of social entrepreneurs working to empower and provide economic opportunities to artisans in developing countries. From jewelry to rain sticks, from table linens to toys and clothing, you’ll find gorgeous artworks from around the globe. Sales benefit thousands of disadvantaged artisans worldwide. Restaurant for lunch is located across the street. No need to get on and off the bus! Plan on 3-4 hours total. Customize entertainment for your group! The beautifully designed Writers Theatre can provide you with great performance options that are sure to please. Scheduled performances at the North Shore Center for the Performing Arts in Skokie bring world-class entertainment to the North Shore. 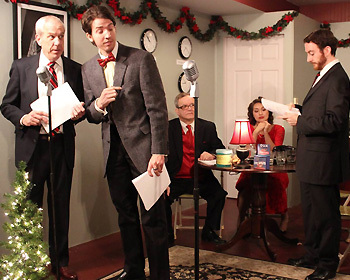 Visit Oil Lamp Theater for an intimate group experience or check out Music Theater Works, which offers musical theatre with full orchestral accompaniment. Actor’s Gymnasium Circus & Performing Arts- unique and amazing talent, including aerialists, fire-breathers and more. Rock House Glenview has free live music, karaoke and the largest coffee roaster on- site. Complement any performance with a group lunch or dinner to make your outing complete. Evanston, home to Northwestern University, is a cultural hot spot. Visit the renowned Mary and Leigh Block Museum of Art, the fine arts museum of Northwestern University. Next, you’ll want to visit to The Levere Memorial Temple, a memorial to Sigma Alpha Epsilon members who lost their lives in the war. The temple is an architectural treasure and contains a custom designed collection of Tiffany Stained Glass. Native American art is on display at the Mitchell Museum of the American Indian. Afterwards, enjoy a delicious lunch in Downtown Evanston. Chicago’s North Shore is home to some of the most stunning shopping centers in the Midwest. Westfield Old Orchard is an open-air, upscale shopping center with gorgeous landscaping and more than 170 premier stores. Upscale Northbrook Court is an indoor shopping mall featuring some of the best names in retail. 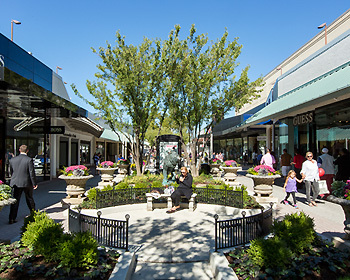 The Glen Town Center offers a charming community of retailers and Abt Electronics, the mecca for high-end electronics and one of the largest retailers in the nation, boasts a state-of-the-art recycling center and behind-the-scenes tours of its facility. Discover the Evanston History Center, once the home of U.S. Vice President Charles Gates Dawes, with original artwork and furnishings. 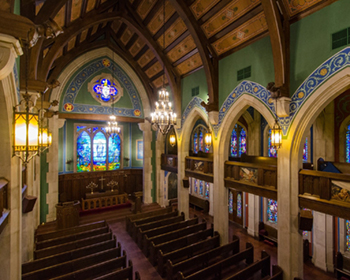 From there, step into the Levere Memorial Temple, home to the Fraternity Service Center and serving as a memorial to Sigma Alpha Epsilon’s who lost their lives in war. Enjoy the gothic style building with a specially-designed collection of Tiffany stained glass. Break for lunch at Trattoria DOC, serving Italian favorites and wood-fired pizzas. Afterwards explore Dave’s Down to Earth Rock Shop, a Pre-Historic Life Museum showcasing one of the largest private collections on display in United States. 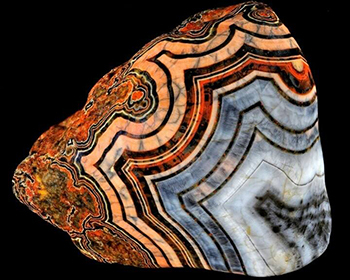 Bring home a fossil, colored mineral or unique jewelry as a souvenir of your trip. Round out your tour at Ten Thousand Villages, a fair trade retail phenomenon founded in 1946 by visionary entrepreneur Edna Ruth Byler. This global network of social entrepreneurs works to empower and provide economic opportunities to artisans in developing countries. Find everything from rings to children’s games to rain sticks in this unique store. 1. How many hours can we fill in a day? 2. What time of year are you visiting? 3. Do you like “Mystery Tours”? 4. How many people are in your group? Brewery and Distillery Tours on the North Shore.